Joshua Clottey sauntered down the dusty streets of Bukom, a small village on the outskirts of Accra, his eyes keenly scanning the people around him. His bright blue Adidas T-shirt brightly contrasts the tiny homes with tin roofs lining the dirt road, and drew the attention of many people who interrupted him, eager to chat with him. He walked up to a small shack at the corner of a soccer pitch and glanced at a mural of him by the door before entering. Clottey, 36, is renowned within this community and in Ghana as one of the many great boxers to have passed through the boxing gyms in Bukom, a small, densely populated shantytown about the size of Manhattan’s Central Park. The former International Boxing Federation (IBF) welterweight champion, who has fought famous boxers such as Manny Pacquiao, follows the tradition of boxing world champions to have emerged from Bukom, like Alfred Kotey and Azumah Nelson. In the face of poverty and high unemployment rates, many men in Bukom see boxing as a way out of their impoverished lifestyle, seeking the dream that has come true for their fellow countrymen such as Clottey. Although many of them do not make it to the international stage, it is remarkable how boxing draws these men back to Bukom like magnets. Francis Quardey started boxing at the age of 8, and represented Ghana in the amateur boxing team for five years after turning 17. He fought in countries such as Cuba and Germany, and had 12 victories in 16 bouts, including 10 knockouts. However, he was not represented by a manager or a promoter, and had to give up his boxing dreams due to financial difficulties. After retiring in 1992, Quardey, now 44, learnt how to repair photocopiers to make money. However, his passion for boxing prevailed, and he is now an assistant trainer at the Discipline Boxing Academy in Bukom in hopes that the current boxers will be more successful than him. He runs a small business of photocopier repairs because the job at the gym comes with little to no pay. “We have talents in Bukom...but there is no one there to help them,” Quardey said. Ebenezer Sowah Thompson, like Quardey, believed that boxing would change his life for the better. During his eight-year amateur career, he had a record of winning close to 80 out of 84 fights. However, due to a shoulder injury, his dreams of becoming a professional boxer slowly deteriorated, and he hung up his gloves in 1993. “I totally lost everything. My whole life I’ve been boxing, but because of my injury, I haven’t gone far,” Thompson said, shaking his head. Nevertheless, Thompson, 46, returned to Attoh Quarshie Boxing Club in Bukom to be an assistant coach because he wanted to impart his knowledge and experience in boxing to the current boxers, even though the job does not pay. He doubles as a security guard at a private residential complex to make ends meet. Thompson’s boss and head trainer of Attoh Quarshie, Godwin Kotey, believes that a major issue adversely affecting the sport in Ghana is the lack of support from the boxing administrations, namely the Ghana Boxing Authority (GBA) and the Ghana Amateur Boxing Federation (GABF). He added that the lack of promotion, motivation and funding for amateur boxers have led to poor financial returns for them, contributing to the increasing number of amateur talents dropping out of the sport. “If you want to build a skyscraper, then the foundation has to be a very firm one. Or else you build it…and the whole thing comes down,” Kotey said, referring to the importance of improving amateur boxing. The Greater Accra Amateur Boxing Association (GAABA) is currently organizing an amateur boxing tournament that will feature regular fights for amateurs The secretary-general Alex Ntiamoah-Boakye, is hopeful that this tournament will help unearth talents and give them the reputation and support that amateur boxers need. The planning phase has not been entirely smooth, with the GAABA running into difficulty securing sponsors from companies like major telecommunications company MTN. Robert Odarkwei Lamptey Jr., the secretary-general of the GBA, echoed the difficulty of securing corporate sponsorship for boxing events. "The impression that boxing is a dangerous sport deters corporate entities, who would have pushed in investments for boxing events, from coming to assist," Lamptey said. However, cases of corporate sponsorships for combat sports do exist. Orange, a French telecommunications company, is a principal sponsor in laamb, a form of traditional wrestling in Senegal and arguably the most popular sport there. GAABA has secured some sponsorship from smaller local companies, and Ntiamoah-Boakye is optimistic that more will follow. He also believes that the tournament will help more than just develop future boxing champions. “Bukom, if I may say so, is not a middle-class income community, and if the government would invest, or public bodies would invest, I think we would be able to raise their standards to middle-class because of the sport,” Ntiamoah-Boakye said. Although others such as Kotey agree that boxing can help raise the standard of living in Bukom now, Fritz Baffour, the Minister of Information, and it’s local Member of Parliament warns that it is not an easy task. He explained that Bukom is a fishing community made up of primarily the Ga people, who worked as fishermen and stevedores. Their history of hard labor and their culture of showing physical might in unarmed combat developed them into great pugilists. Many simply have no intention to leave the village, even with its high poverty level. Although opportunities to climb the economic ladder such as free education and finding jobs in other parts of Accra, the passion of boxing prevails and people choose to stay. One thing that remains certain is the continued flow of boxers from Bukom, all pursuing the dream of becoming the next Clottey, trained by those who have failed but want to help others live that dream. “We come into this world to fight for our right, to survive. 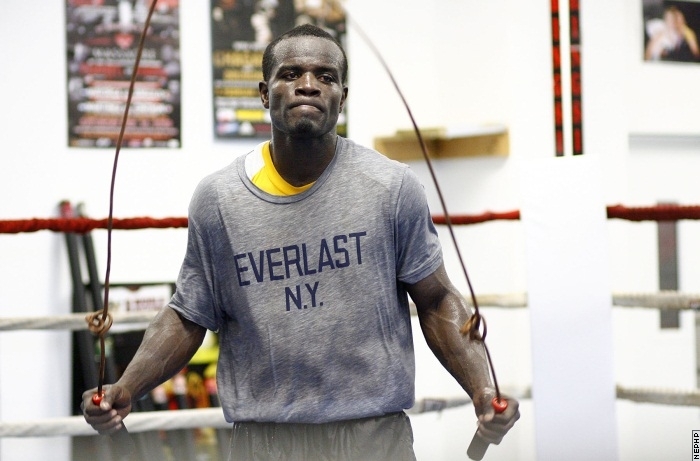 So everything depends on us, to become who we want to be…you have to be hard, stand on your toes, keep fighting, keep doing what you do best,” Clottey said. Bin Mohamed Sultan participated in New York University Journalism’s 2012 ‘Reporting Africa’ program.